Soil Type: Volcanic lava and ash mix, known locally as "pozzolana". Vine Trellising Methods: Multiple parcels utilizing me short Guyot, Mberello and Capanno methods. Vinification Information: The Aglianico is de-stemmed and crushed in small batches and then fermented in stainless steel with a maximum temperature controlled to 28-30 degrees Celsius. Malolactic fermentation takes place within 100% new French oak barriques and matured for 12 months. The wine is fined in the bottle for an additional 6 months before being released to the market. "Doctorwine" has rated the wine "Elena Fucci Titolo Aglianico del Vulture, Basilicata, Italy" from the vintage 2004 on 31.01.2016 with 97 of 100 points.
" A bright, very intense ruby color and a slightly austere aroma that becomes imperious with its scent of blood orange, the floral notes of lavender, a light touch of menthol, some red prune and a hint of tea. The excellent mouthfeel has refined tannins, the product of the high altitude of the vineyards and Elenaâ€™s skillfulness. The progression is silky and a juicy with an almost infinite finish that has notes that are even fresher. " "Doctorwine" has rated the wine "Elena Fucci Titolo Aglianico del Vulture, Basilicata, Italy" from the vintage 2012 on 31.01.2016 with 96 of 100 points.
" An almost impenetrable color and an aroma with scents of spices like cardamom followed by those of sour cherry, rose and red prune. Although it is still very young, you can already sense the notes of blond spice. The mouthfeel has a lot of impact with refined yet pronounced tannins. The finish is excellent and while it is still a little nervous it has enough class to foresee a great future. " "Doctorwine" has rated the wine "Elena Fucci Titolo Aglianico del Vulture, Basilicata, Italy" from the vintage 2006 on 31.01.2016 with 95 of 100 points.
" Age has significantly enhanced the value of this wine. It has a nice, dark ruby color which is actually bright for the area. The bouquet is as intriguing, intense and clean as always but with more dark fruit, like prune and blackberry, while the floral component is darker without being gloomier, with an additional note that is between a smoked sensation and black tea. The profile of the tannins is also different, better upheld, less polished yet never bothersome thanks to the density and compact texture of the mouthfeel. An excellent tactile sensation ushers in a very deep finish where there is a return of captivating dark notes. " "Doctorwine" has rated the wine "Elena Fucci Titolo Aglianico del Vulture, Basilicata, Italy" from the vintage 2011 on 31.01.2016 with 94 of 100 points.
" A warmer year produced a fatter wine. This has a classic, very dark and slightly opaque color and an aroma with warm notes of dark prune and maple, some smoky hints and a touch of almond. A balsamic streak upholds bouquet and embellishes it with a lot of ripe fruit. The mouthfeel is intense and compact, making this bold wine a product of its harvest but without the possible defects thanks to Elenaâ€™s excellent knowledge of the land and her craftsmanship. The attack is soft and sweet and the progression is compact and never too sweet, while the finish is flavorful. " "Doctorwine" has rated the wine "Elena Fucci Titolo Aglianico del Vulture, Basilicata, Italy" from the vintage 2003 on 31.01.2016 with 94 of 100 points.
" A dark, almost youthful ruby color while the nose is intact and broad, with floral scents like lavender and violet, a fruity hint of prunes, even yellow ones, a touch of peach and warm, blond spices. The mouthfeel is very refined and consistent with a lovely progression and an engaging finish. " "Doctorwine" has rated the wine "Elena Fucci Titolo Aglianico del Vulture, Basilicata, Italy" from the vintage 2008 on 31.01.2016 with 94 of 100 points.
" An example of refined youth with its deep, pigeon blood color. The wine has the estateâ€™s classic bouquet with scents of lavender and violet followed by those of dark fruit which are typical of good years (this one was defined as â€˜perfectâ€™) and here include prune and blackberry, a hint of myrtle and an aromatic smoked note. Here again the tannins are excellent yet still young and almost untamed, something which the mouthfeel struggles to contain. Overall an excellent, tasty and juicy wine with an intact aftertaste. " "Doctorwine" has rated the wine "Elena Fucci Titolo Aglianico del Vulture, Basilicata, Italy" from the vintage 2013 on 31.01.2016 with 93 of 100 points.
" Deep, opaque ruby. Wood on the nose, intense and a little overwhelming; then notes of licorice, sour black cherries and tobacco. Flavor a little young and coarse, with tannins only partly balanced by the fruit. Excellent body and alcohol; good weight and a long finish. " "Doctorwine" has rated the wine "Elena Fucci Titolo Aglianico del Vulture, Basilicata, Italy" from the vintage 2010 on 20.11.2013 with 90 of 100 points.
" Here we are back in the south, in Basilicata, but not the stereotype one that is hot, muggy and dry. Vulture is a volcanic area with few southern characteristics and where it can get quite cold and windy. Here Aglianico is king, a southern grape that is also very widespread in other regions like Campania (where it is used as the base for Taurasi DOCG). It ripens late and harvest often does not begin until the beginning of November, sometimes even after the first snow. A very tannic grape that makes strong wines. Elena Fucci is a small winemaker (producing just 15,000 bottle of this wine) and while she may be young, she is certainly among the best in the area. Very passionate about her work, she cultivates her vineyards â€“ that are 600m above sea level â€“ as if they were her garden. Her style is quite modern and the wine has an intense and concentrated ruby color, while the aroma is distinctly fruity, above all black cherry and blueberry, together with some traces of spice. The attack is quite tannic but nicely upheld by the acidity making the mouthfeel juicy and tasty with a very long finish. " 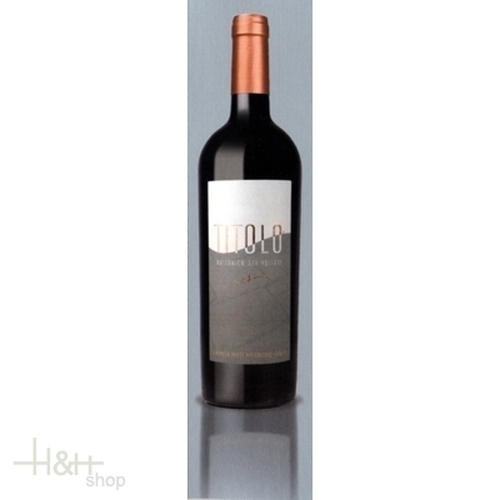 "Doctorwine" has rated the wine "Elena Fucci Titolo Aglianico del Vulture, Basilicata, Italy" from the vintage 2009 on 14.05.2013 with 95 of 100 points.
" This red is extremely handcrafted and produced in limited quantities. It has an intense garnet color, a complex aroma with scents of red fruit, as well as mineral ones, and a thick, tannic and rich flavor. Serve at 18Â°C with roast kid and game in general. " "Doctorwine" has rated the wine "Elena Fucci Titolo Aglianico del Vulture, Basilicata, Italy" from the vintage 2007 on 26.12.2011 with 96 of 100 points.
" Aglianico grapes. A fresh vintage, with the harvest quite late, beginning November 2. a magical version, which presents itself with an intense ruby color, concentrated and extremely bold. A bouquet which is complex and refined, which passes from the usual black cherries to spicy scents, of pepper and nutmeg, together with aromatic herbs and a tad of incense. The flavor is taut and elegant, with pronounced tannins, a nice tartness and a taste profile of great class, balanced, almost tallowy, with a subtle and extremely persistent aftertaste. " "Doctorwine" has rated the wine "Elena Fucci Titolo Aglianico del Vulture, Basilicata, Italy" from the vintage 2005 on 26.12.2011 with 94 of 100 points.
" Aglianico grapes. A fresh vintage, harvested slightly late, with picking begun November 4. It has an intense and nicely concentrated ruby color with slight garnet nuances. The bouquet is complex, with fruity scents of black cherries, some spice and hints of tar in the background. The initial taste is slightly tannic, upheld well by a tartness which immediately refreshes and does not dry out salivation. An excellent alcoholic/glycerin softness and a long, subtle, warm aftertaste. " "5StarWines - Vinitaly" has rated the wine "Elena Fucci Titolo Aglianico del Vulture, Basilicata, Italy" from the vintage 2014 on 28.04.2017 with 94 of 100 points. "Wine Spectator" has rated the wine "Elena Fucci Titolo Aglianico del Vulture, Basilicata, Italy" from the vintage 2013 on 30.09.2016 with 90 of 100 points. "Wine Spectator" has rated the wine "Elena Fucci Titolo Aglianico del Vulture, Basilicata, Italy" from the vintage 2012 on 31.07.2015 with 92 of 100 points. "Luca Gardini" has rated the wine "Elena Fucci Titolo Aglianico del Vulture, Basilicata, Italy" from the vintage 2013 on 01.07.2015 with 90 of 100 points. "Robert Parker The Wine Advocate" has rated the wine "Elena Fucci Titolo Aglianico del Vulture, Basilicata, Italy" from the vintage 2004 on 30.04.2015 with 97 of 100 points. "Robert Parker The Wine Advocate" has rated the wine "Elena Fucci Titolo Aglianico del Vulture, Basilicata, Italy" from the vintage 2000 on 30.04.2015 with 96 of 100 points. "Robert Parker The Wine Advocate" has rated the wine "Elena Fucci Titolo Aglianico del Vulture, Basilicata, Italy" from the vintage 2009 on 30.04.2015 with 95 of 100 points. "Robert Parker The Wine Advocate" has rated the wine "Elena Fucci Titolo Aglianico del Vulture, Basilicata, Italy" from the vintage 2008 on 30.04.2015 with 95 of 100 points. "Wine Spectator" has rated the wine "Elena Fucci Titolo Aglianico del Vulture, Basilicata, Italy" from the vintage 2011 on 15.11.2014 with 90 of 100 points. "Luca Gardini" has rated the wine "Elena Fucci Titolo Aglianico del Vulture, Basilicata, Italy" from the vintage 2011 on 01.07.2014 with 85 of 100 points. "Vinum Wine Magazine" has rated the wine "Elena Fucci Titolo Aglianico del Vulture, Basilicata, Italy" from the vintage 2009 on 01.08.2013 with 15 of 20 points. "Vinous Antonio Galloni" has rated the wine "Elena Fucci Titolo Aglianico del Vulture, Basilicata, Italy" from the vintage 2009 on 01.02.2013 with 93 of 100 points.